The 2016 Summer Olympics are inspiring and captivating us all right now, and I’m loving the Rio games! Like expectant parents, these athletes have long prepared and planned for this day, and they have a team of support around them to help them reach their goals. It got me thinking, what would an Olympic birth team look like? 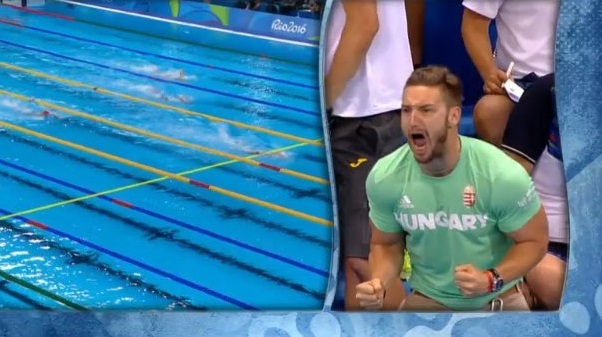 Hungarian swimmer Katinka Hosszu’s husband jumped, cheered, and couldn’t contain his excitement and pride at her impressive physical feat. He is SO proud of his partner, and yours is too! Your partner cheers you on, has walked this journey with you from the beginning, prepared with you, and supports you through the whole thing. Your midwife or OB has a job like none other, but in Olympic terms is sort of like the referee- they keep a close eye on you and your tiny teammate to keep you safe and healthy and rocking your game. They intervene when necessary, but their primary job is to facilitate a good game, or in your case a healthy birth! Sometimes though they’re more like a coach, and they support you in your goals too. You have a coach to help you get where you want to be; you need someone who is trained and experienced to help you reach your goals. They understand the way the game works, offer encouragement, physical support, and tips to help you do your best. Your coach can help you feel calm and relaxed, and keeps your eyes on the prize. Your coach’s only goal is for you to feel supported, because when you receive incredible support it’s a win win! If you’re giving birth to your own little Olympian, congratulations! Contact DFWdoula to add labor support to your Olympic birth team.